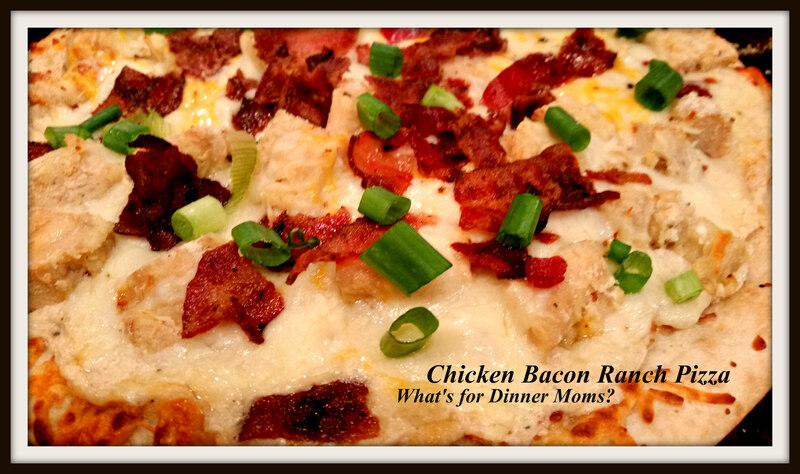 Meal 2 – Chicken, Bacon, Ranch Pizza – What's for Dinner Moms? So, we started this meal yesterday with Meal 1 – Baked Chicken Nuggets (click for link to post). I made an extra pound of chicken nuggets so that I could have leftovers for dinner tonight. I am personally NOT a fan of leftovers but if I can make them into something completely new I am fine with them. I just don’t like eating the same meal two nights in a row. We LOVE pizza. I am constantly looking for new toppings to try. We had the leftover chicken nuggets from dinner the other night and I wanted to use them up and as it was pizza night I needed to get creative. 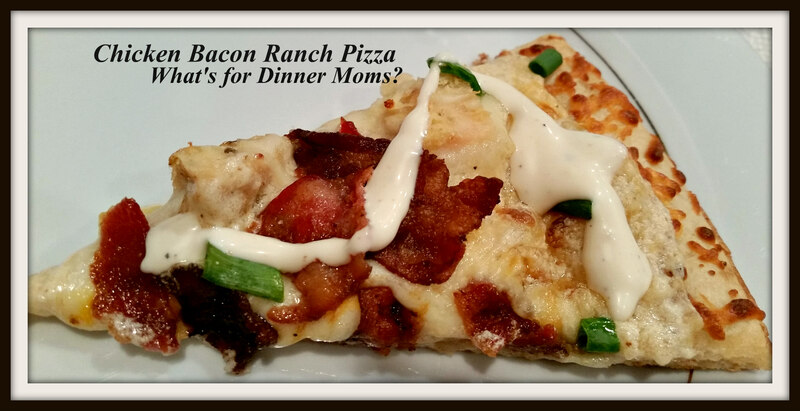 One of my kids favorite toppings for their pizza is bacon. Chicken and bacon go well together. But, I didn’t think a red sauce was right for this pizza. A nice garlic sauce with some ranch flavoring. And bright green onions sprinkled over the top of ours. Now, I just had to get my kids had to agree to it. This was far better than everyone thought it would be! I got “THE FACE” when I mentioned what dinner was going to be. You know the one with the scrunched up nose and the down-turned lips. But, once they all tried it they all said how good it really was and how surprised they were. They all finally agreed to let me put the ranch dressing on the pizza and every one of them said it added just that little bit extra that made it really tasty. Begin making the garlic sauce by melting the butter with the olive oil together in a saucepan over medium heat. Once the butter is melted add the garlic to the pan and stir well. Allow the garlic to become fragrant about 1 minute or so. Add the half and half to the pan and allow it to come to a slow boil. Continue stirring the mixture as you add the cheese. The mixture should begin to thicken in 3 to 5 minutes. If it doesn’t thicken to your preference add a bit of flour sprinkled over the top and continue to stir. Once the mixture thickens remove from heat. Taste the sauce and adjust the taste by adding salt, pepper and red pepper flakes if desired. Divide the sauce in half between the two pizza crusts. Spread the sauce over the crusts leaving a half-inch around the edges of the crust plain. Top the sauce with 1/2 of the chicken on each crust. Then divide the cheese between the two crusts and sprinkle over the top. Finally, the bacon! Sprinkle the crumbled bacon over the top of the two crusts. Bake for 10-12 minutes until top is browning and pizza is heated through. Remove pizza from the oven and allow to sit for 5 minutes before slicing. Serve pizza with green onions sprinkled over the top and a drizzle of ranch dressing over the slices. Wow…. makes me rethink my dinner lol 😉 So yum! It was good! Of course in our house anything with bacon is good. Everyone needs a pizza night! That looks sooo good! We might have to try that! We are all fans of pizza and ranch dressing! It was good. Hope you like it as much as we did! Sounds really yummy! Great use for leftover chicken! Thank you! For me it is all about the easy! It’s super simple if you plan ahead too!